Courageously They Died, By Inspiration They Live! The 126 year history of the Los Angeles Fire Department has been one of the most inspiring and courageous on record. Yet, in the long history of the department, there has not been a place to remember and memorialize those members of the department who gave their lives so that others might live. Now, for the first time, there is. 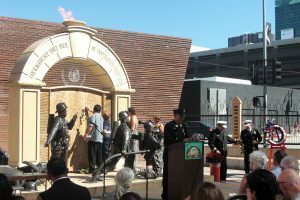 The Fallen Firefighters Memorial is situated in the heart of Hollywood, just outside Old Fire Station 27 on Cahuenga Blvd. The dramatic plaza is home to a memorial wall, listing the names of every known department member who died while at an incident or as a result of a duty-related cause. In front of this wall, a series of bronze statues, each one carefully representing an LA firefighter is on display. The concept for these statues was designed by Los Angeles Fire Captain Duane Golden. 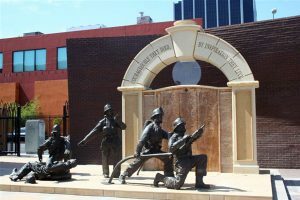 The statues represent a fire company during an incident in the city. Two firefighters are involved in fire attack, while a fallen member is being attended to by another member. The Captain, responsible for his crew and the fire, is making a command decision relative to attacking the flames, while also providing care for the downed firefighter. Of special note, the firefighters are not wearing protective face pieces (as they normally would) so that you can see their faces and expressions. The display is one you can view for an extended period of time. Its message seems to change, depending on the angle and point of view you take. From any angle, the teamwork, spirit, and family nature of the fire service is presented. These remarkable life-sized statues were developed and created in Minnesota for the Memorial Plaza by Honors for Excellence. Please support the Fallen Firefighters Memorial in Los Angeles. Purchase a memorial paver and dedicate it to a family member, a friend, or a firefighter from anywhere around the world. The paver will be permanently placed in the memorial plaza in front of Fire Station 27 for all visitors to see and admire.